Romanization(transliteration) is the process of transcribing a language in the Latin alphabet. Lao Tzu(Lao zi) is the name of a legendary taoist(daoist) philosopher, the alternate title of the early Chinese text better known in the West as the Tao Te Ching(Daodejing),and the moniker of a deity in the pantheon of organized “religious Daoism” that arose during the later Han dynasty (25-220 CE). Laozi is the pinyin Romanization for the Chinese characters which mean “Old Master.” Laozi is also known as Lao Tan (“Old Tan”) in early Chinese sources. The Zhuangzi is the first text to use Laozi as a personal name and to identify Laozi and Lao Tan. The earliest materials associated with Laozi are in the Zhuangzi’s Inner Chapters. The Outer Chapters of that work have ten logia in which Laozi is the main figure, four of which contain direct attacks on the Confucian virtues of ren, yi, and li that are reminiscent of passages from the Daodejing and probably date from the period in which that collection was reaching some near final form. The earliest ascription of authorship of the Daodejing to Laozi is in Han Feizi and the Huainanzi, but several themes from the Laozi logia of the Zhuangzi are traceable into the Daodejing and on at least two occasions in that text Laozi counsels following dao (the Way) to possess de (virtue). Laozi became a principal figure in institutionalized religious forms of Daoism. He was often associated with many transformations and incarnations of the dao itself. 56. 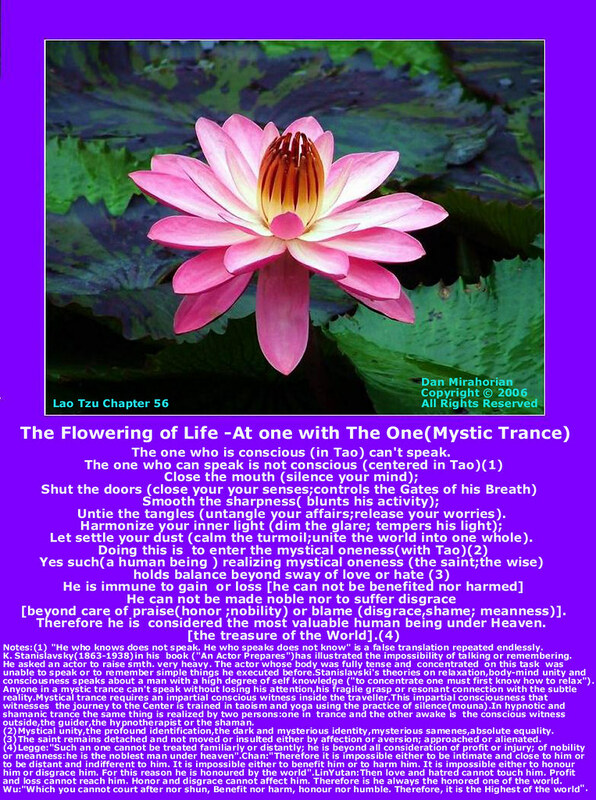 The one who is conscious (in Tao) can’t speak. Untie the tangles (untangle your affairs;release your worries). Let settle your dust (calm the turmoil;unite the world into one whole). He can not be made noble nor to suffer disgrace [beyond care of praise(honor ;nobility) or blame (disgrace,shame; meanness)]. (1) “He who knows does not speak. He who speaks does not know” is a false translation repeated endlessly. Konstantin Stanislavsky(1863-1938) in his book ( “An Actor Prepares”),about” The Professional Training system of an Actor” has illustrated the impossibility of talking or remembering.He asked an actor to raise smth. very heavy. The actor whose body was fully tense and concentrated on this task was unable to speak or to remember simple things he executed before. Stanislavski’s theories on relaxation,body-mind unity and consciousness speaks about a man with a high degree of self knowledge(“that to concentrate one must first know how to relax”) Anyone in a mystic trance can’t speak without losing his attention,his fragile grasp or resonant connection with the subtle reality.Mystical trance requires an impartial conscious witness inside the traveller. 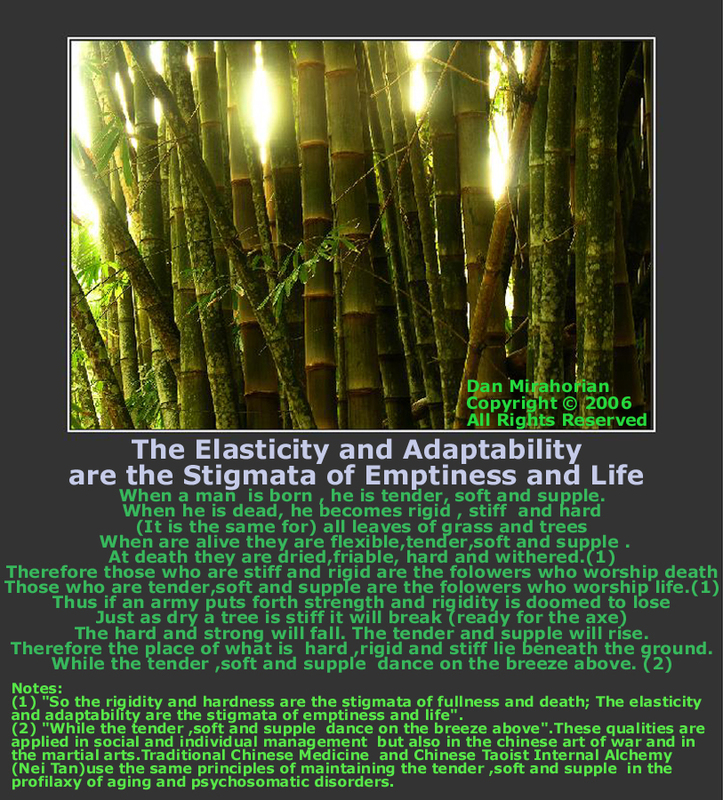 This impartial consciousness that witnesses the journey to the Center is trained in taoism and yoga using the practice of silence(mouna).In hypnotic and shamanic trance the same thing is realized by two persons:one in trance and the other is the conscious witness outside,the guider,the hypnotherapist or the shaman. (2) Mystical unity:the profound identification,the dark and mysterious identity,mysterious samenes,absolute equality). (3) The saint remains detached and not moved or insulted either by affection or aversion; approached or alienated. meanness:he is the noblest man under heaven”. efore it is impossible either to be intimate and close to him or to be distant and indifferent to him. It is impossible either to benefit him or to harm him. It is impossible either to honour him or disgrace him. For this reason he is honoured by the world”. Crowley:”He cannot be insulted either by familiarity or aversion; he is immune to ideas of gain or loss, of honour or disgrace; he is the true man, unequaled under Heaven”. LinYutan:”Then love and hatred cannot touch him. Profit and loss cannot reach him. Honor and disgrace cannot affect him. Therefore is he always the honored one of the world”. Wieger:”No one can attach himself (by doing favours) to such a man, nor repulse him (by treating him badly). He is indifferent to gain or loss, exaltation or humiliation. Being thus, he is the most noble in the world”. Wu:”Which you cannot court after nor shun, Benefit nor harm, honour nor humble. Therefore, it is the Highest of the world”. 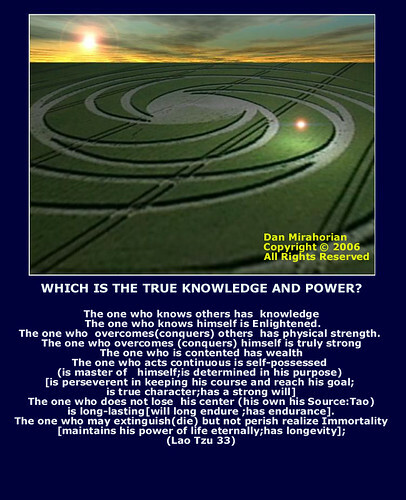 WHICH IS THE TRUE KNOWLEDGE AND POWER? CARE ESTE ADEVARATA CUNOASTERE SI PUTERE? The one who knows himself is Enlightened. The one who overcomes(conquers) others has physical strength. is long-lasting[will long endure ;has endurance]. 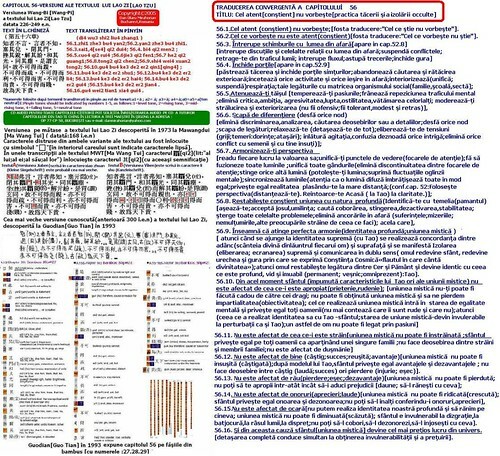 Asa ca pana si Zen-ul a facut un compromis si a recunoscut pasi succesivi ai constientizarii care conduc mai aproape de momentul(din prezentul continuu)de dincolo de timp al Iluminarii.Despre asta e vorba in aceasta carte.In sec.XII maestru chinez Kakuan a desenat cei zece tauri,intemeiat pe o mai veche traditie taoista a taurilor ,si a scris comentariile in versuri si proza traduse aici.Versiunea sa este Zen pur, si merge mai in profunzime decat precedentele versiuni care sfarseau cu vidul(nimicul) din tabloul opt. The enlightenment for which Zen aims, for which Zen exists, comes of itself. As consciousness, one moment it does not exist. But physical man walks in the element of time even as he walks in mud, dragging his feet and his true nature. So even Zen must compromise and recognize progressive steps of awareness leading closer to the ever instant of enlightenment. That is what this book is about. 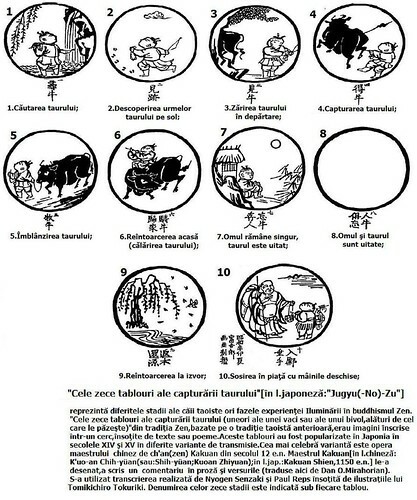 In the twelfth century the Chinese master Kakuan drew the pictures of the ten bulls, basing them on earlier Taoist bulls, and wrote the comments in prose and verse translated here. His version was pure Zen, going deeper than earlier versions, which had ended with the nothingness of the eighth picture. It has been a constant source of inspiration to students ever since, and many illustrations of Kakuan’s bulls have been made through the centuries. 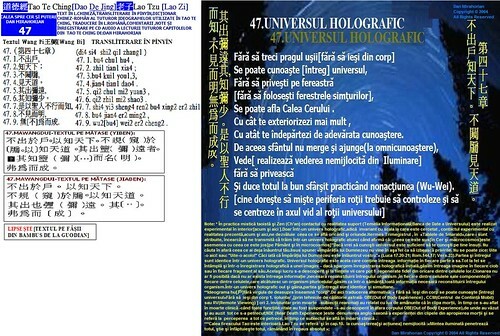 tual unfoldment paralleled in every bible of human experience. May the reader, like the Chinese patriarch, discover the footprints of his potential self and, carrying the staff of his purpose and the wine jug of his true desire, frequent the market place and there enlighten others. 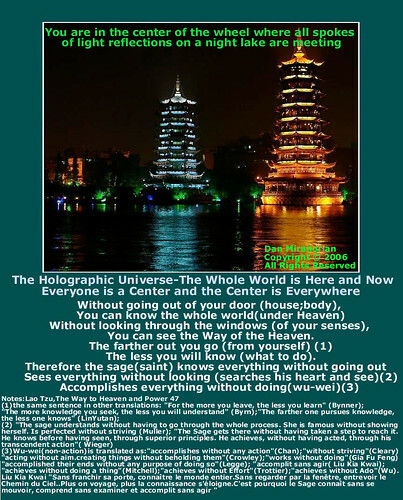 You are currently browsing the Laotzulaozi's Blog blog archives for December, 2006.